Travelling with only four T-Shirts, two pair of Jeans and one pair of shoes. Sounds unrealistic? It is not, ESN Slovakia and Eurosender can offer you the solution: Simply send your baggage home. 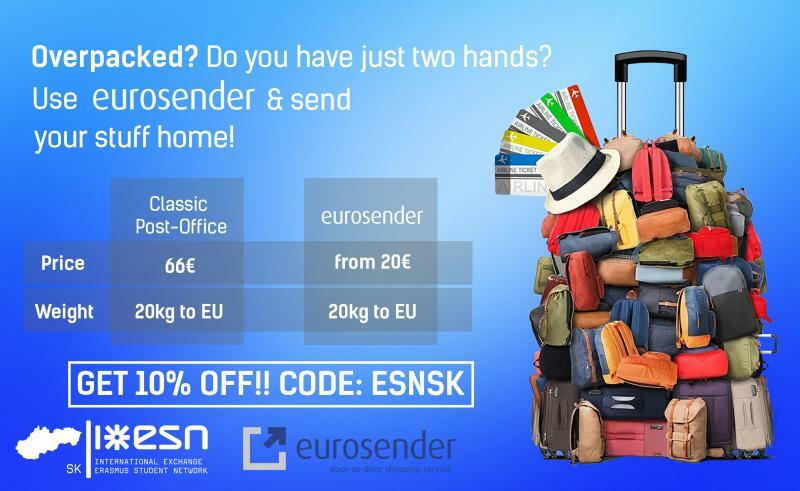 The strategic partnership between ESN Slovakia and Eurosender is resulting now in an exclusive discount (code ESNSK) for all Eurosender shipping services. All students in Slovakia are now exclusively entitled to a special 10% discount by entering the promo code ESNSK when booking their Eurosender order. Book now here.